Unitech's RH767 UHF handheld mobile terminal UHF and HF RFID Reader is a rugged technology multi-tag UHF RFID and bar code reader. It can read both EPC Gen 1 and Gen 2 RFID tags and comes with embedded RFID middleware and Windows CE 5.0 for easy integration. Connectivity options include WLAN 802.11b/g and Bluetooth. 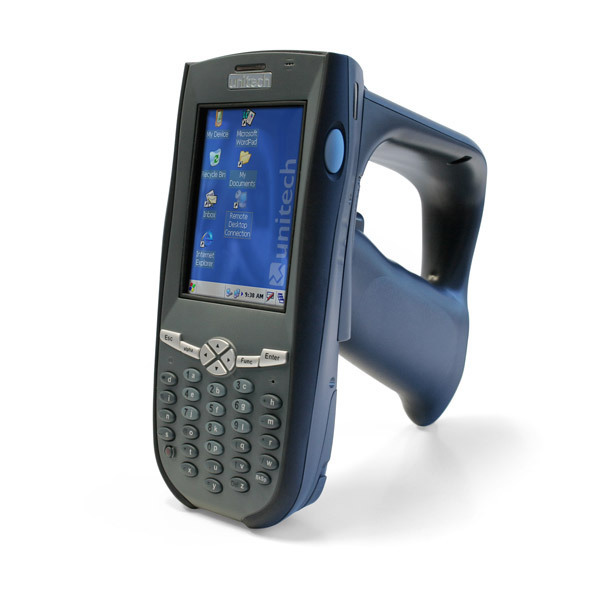 Unitech's RH767 HF handheld terminal is a rugged dual technology multi-tag HF RFID bar code reader. It can read 15963/ISO 1443A/B RFID tags and comes with embedded RFID middleware and Windows CE 5.0 for easy integration. Connectivity options include WLAN 802.11 b/g, Bluetooth, and GPRS (via the PCMCIA slot). The RH767 is equipped with 36 backlit keys that can easily toggle between full alphabetical input, functional input, or numerical input for users who want a direct way to input text or functions. The backlit touch screen can also be used for navigation and input. Both the UHF and HF RH767 models were ruggedly designed to withstand multiple drops to concrete and the IP55 rating protects the device from water and dust. The RH767 has a battery life of up to 20 hours, ensuring limited downtime. Ready for integration into supply chain management for retail operations, industrial manufacturing and logistic applications, the RH767 is ideal wherever RFID reading is needed.